This work consists of a large 20’ tall concrete structure, entirely covered with ceramic tile mosaic. The stele form has a rounded, half-column on the side facing the intersection and a curved banco, approx. 2’ in height designed for seating. The mosaic patterns include numerous images from Aztec and Mimbres iconography that relate to the pre-historic Road of Life, later El Camino Real stretching from Mexico north along the Rio Grande through the Albuquerque area, generally where 4th Street is today. The sculpture is a landmark for North Valley neighborhoods, welcoming those passing through the busy intersection in all directions – east/west and north/south. Beverley (Bev) Magennis of Apache Creek, New Mexico, is originally from Toronto, Canada. She came to New Mexico in the mid-1970s as part of Roswell’s Artist-in-Residence Program. 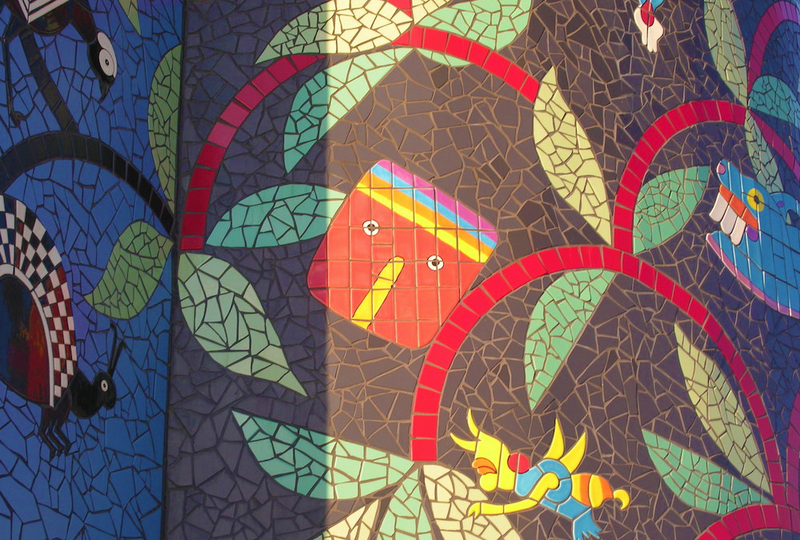 She has created many large-scale mosaic works including the Tile House in Albuquerque’s North Valley.